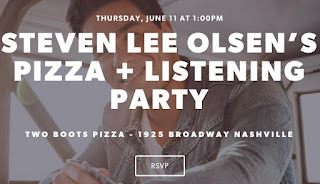 Steven Lee Olsen is having a CMA Fest Pizza Party on June 11th at 1:00pm CT at Two Boots Nashville (1925 Broadway). Come hang out, listen to some NEW music, and eat some pizza! Click here to RSVP. See our complete fan party listing here!